Amongst the various cryptocurrency exchanges that can be found these days, Bitfinex is a popular name because it has been consistently ranked as one of the best in regard to daily trading volumes. As a matter of fact, Bitfinex is one of the most well-known cryptocurrency trading platforms that are operating in today’s market as it caters to both novice and experienced traders, along with institutions. Moreover, at Bitfinex, you can enjoy a variety of trading options, trading pairings and coins. This cryptocurrency exchange aims to be the premiere destination for professional traders from all over the world and has earned the trust of millions. These trading volumes are approximately 6.27% of the market and Bitfinex has managed to achieve such impressing numbers due to the efforts of the team working behind the exchange. It has a dedicated team that’s focused on providing its traders with a high level of service by giving them access to a wide selection of coins, a comprehensive interface and low fees. Apart from that, Bitfinex also facilitates fiat deposits and comprises of a variety of cryptocurrencies as there are almost 72 active market pairs available. Institutional investors are also partial to this exchange and it boasts an OTC desk for high value over-the-counter trades. This cryptocurrency exchange boasts a comprehensive, robust and highly customizable interface, which is well-designed and modern. Experienced users will find it more suitable for their needs as the main dashboard displays different options and a number of tabs along with a varied selection of advanced charting tools. Trading View charts are also offered by Bitfinex and there is a mobile app available for both iOS and Android users. The platform currently has a support team that is at the disposal of traders 24/7 via email. The aim of this dedicated and professional team is to answer queries in 12 hours, but responses can take some time. Moreover, there is also a knowledge-based sections that has covered all the important aspects and traders can also find an FAQ page for getting answers to common questions. In 2016, Bitfinex became the victim of one of the most high profile security breaches ever seen as hackers succeeded in making away with 120,000 Bitcoins, which were worth $72 million at that time. Within a year, the exchange was able to compensate its customers and because of this experience, security is now a priority for Bitfinex. A number of security techniques used by other cryptocurrency exchanges can also be found here. Only 0.5% of the crypto-assets are kept in hot wallets by the platform and it uses cold storage for keeping the vast majority of funds. In addition to this, database encryption is also utilized by the site along with duplication and DDoS protection in order to ensure that no external influence can halt trading. PGP, 2FA encryption and a horde of advanced verification tools are used by Bitfinex for reinforcing customer accounts that are aimed at monitoring changes in account activity. Bitfinex offers traders a wide array of trading options including margin trading as the exchange gives its clients the opportunity of trading with a leverage of about 3.3x by utilizing their peer-to-peer margin funding functionality. Moreover, it has also provided its users with access to a variety of different order types such as market, limit and stop orders. Some other orders that are also available include post only, OCO, iceberg, fill and kill and trailing stop. This cryptocurrency exchange ranks at the top of the BTC/USD trading market and 6% of all daily trades are conducted via Bitfinex. The combined trading activity of the platform is almost $2 billion, as mentioned above, and this high level of liquidity can be beneficial for users because it allows them to trade with confidence in the price stability on the platform. As of now, the website is offering 72 market pairs linked to four base currencies of EUR, USD, BTC and ETH. Fiat purchases are allowed on Bitfinex for two major cryptocurrencies. Other than that, it allows traders to invest in a host of other cryptocurrencies, which include Bitcoin Cash (BCH), Litecoin (LTC), Dash (DASH), NEO (NEO), Ethereum Classic (ETC), Ripple (XRP), OmiseGO (OMG), EOS (EOS), Monero (XMR), 0x (ZRX) and Zcash (ZEC). 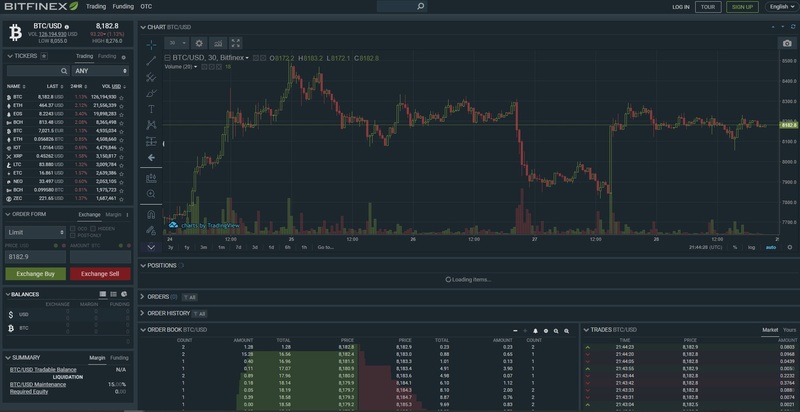 Bitfinex also gives access to USDT Tether and it is one of the few exchanges that also gives traders the opportunity of purchasing IOTA (MIOTA). The team behind Bitfinex is constantly trying hard to increase the number of coins currently being offered on the website and new additions can regularly be found on the platform. When you are creating an account on the platform, the Bitfinex team reminds you that their services are more suited to professional traders because there are certain specifications to be met. The terms and conditions should be read carefully to know what you are getting into. There is a temporary minimum account equity of $10,000 is required to begin trading and verification has to be provided for making fiat deposits and withdrawals. There is a fee schedule provided by Bitfinex that can help you learn about the charges you will have to pay. The fees depends on the trading volume in the last 30 days as well as the taker or maker status. In a nutshell, Bitfinex is one of the most established exchanges in the market, but better aimed at institutional investors and experienced traders.